MyPilotPro is perfect for any private pilot or student pilot who wants to relive their flying experience on an action camera. The mount will attach to any aircraft’s rear or wing tie down. Compatible with action cameras including GoPro and Garmin Virb. MyPilotPro is made in the USA one mount at a time where attention is given to quality craftsmanship. 1 year money back guarantee! Instant 20% Cart Discount when you buy 2 or more! 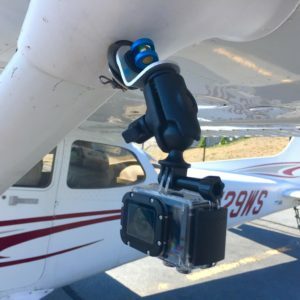 MyPilotPro Mount is the GoPro airplane mount that launched our company. It is made of thick aircraft aluminum coupled with stainless steel and aluminum hardware. You can attach it to any tie down on your aircraft without any tools needed. The cam lever can exert 400 lbs of pressure so you know it is attached securely. Neoprene washers throughout the mount ensure that any vibration can not make its way to the camera. 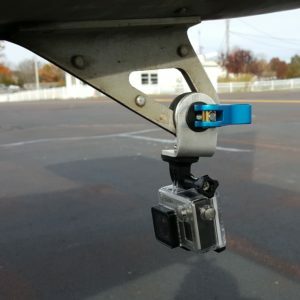 This GoPro airplane mount is truly simple, secure, and does not require any tools to mount! This mount is compatible with action cameras including the Garmin Virb and all GoPro cameras. It is universal for all General Aviation and Light Sport Aircraft. As long as your aircraft has a tie down ring, the MyPilotPro can attach to it. It weighs just 5 oz including all hardware and fits in the palm of your hand. Attaching the MyPilotPro to your tie down ring could not be simpler. The cam lever eliminates the need for any tools and securely attaches the mount your tie down rings by simply closing it. There is a stainless steel cotter pin in the end of the stainless steel rod that ensures the mount can not come off the tie down ring even if loosens up during flight. Taking the mount off your tie down ring is equally easy and just requires opening up the cam lever and unscrewing the knurled nut. The process of attaching and detaching the mount only takes 30 – 45 seconds! I’m very proud of my mounts and stand behind them with a full 1 year satisfaction guarantee. I also believe in that by providing excellent customer service I will gain your future business and referrals. Judging from my customer’s feedback and reviews, they agree with that! Excellent product and details to help install. Beautiful workmanship and reliable design. Bought two to mount GoPro cams on bonanza, kingair and aircam. They work awesome up to and including 255 kias!! The GoPro mount worked perfectly! Good quality and easy to use. The design, engineering and construction of this camera mount is exceptional. The mount is easy to attached and easy to removed from the airplane or any similar eye ring. It is simply the best mount available, and I highly recommend it. The airplane mount is quick and easy to secure on any one of the tie downs. I highly recommend these mounts. I bought the basic MyPilotPro clamp mount. It is durable and well-constructed. However, the threaded center shaft was a little too short to clamp onto my airplane at the spot I wanted. Marshall sent me a cam lever with a longer shaft for no extra charge. Such good customer service is unheard of. Thank you! Really cool mount!!! Now I feel safe to put my GoPro outside the aircraft, no worries about suction cups, security strings, etc…Nice job well done!! This has to be the single best GoPro mount on the market today! It’s so easy to use that my kids set it up as part of our standard preflight. As the owner of a Cessna 172 I had been looking for a solid exterior camera solution for some time. After a quick test flight with the MyPilotPro mounted to my strut tie down I knew I found my product! The quality of the build is first class and the pictures it helps provide are without equal in the market place today. I’m certainly happy that I found this mount when I did! Brilliant concept on how to mount my camera to the outside of my Cherokee! The pivot arm corrects for the dihedral of the wing. No need for the pivot arm for putting the mount on the rear tie down but it’s nice to have for the wing. Put it through some tests today on both the wing and rear and am satisfied with the results. I love that the hardware is stainless steel and aluminum. Rock solid GoPro mount! MyPilotPro Swivel is our flagship product. We’ve teamed up with RAM Mounts® to deliver the best and most versatile action camera mount in the industry! MyPilotPro Swivel allows your action camera to articulate in any direction or angle which allows you to get any shot you want! Attaching MyPilotPro Swivel to your airplane tie downs is simple, secure, and doesn’t require any tools. It’s compatible with all actions cameras including GoPro and Virb cameras. MyPilotPro Swivel is made in the USA one mount at a time where attention is given to quality. 1 year money back guarantee!